Can you think of a more perfect late spring or summer meal than a Grilled Chicken Melt with Pesto and Sun Dried Tomato Spread? I can’t. 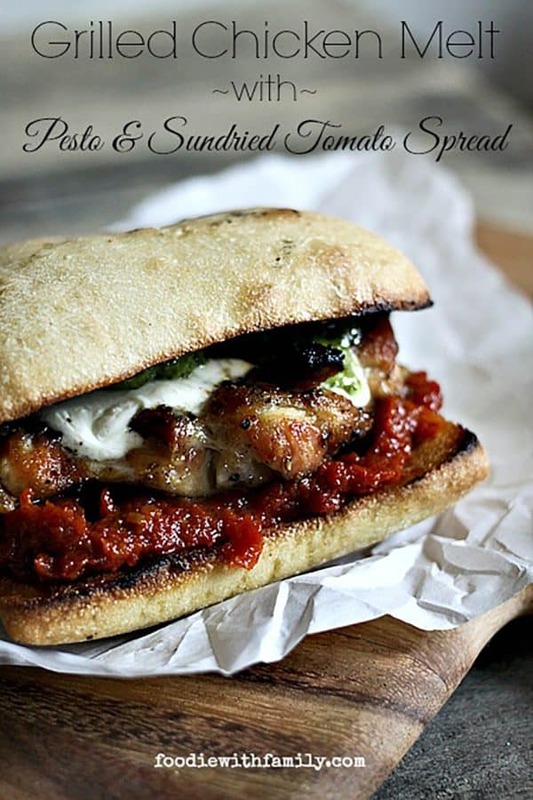 Tender, juicy grilled chicken thighs topped with creamy, gooey, melted fresh mozzarella, fragrant pesto, and flavourful Sun Dried Tomato Spread on a toasted ciabatta bun screams warm weather. 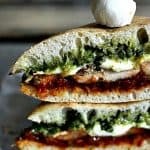 Grilled Chicken Melt with Pesto and Sun Dried Tomato Spread is an ideal recipe for entertaining in warmer months by virtue of both its beauty and ease of preparation. Remember that luscious Sun Dried Tomato Spread I shared last week? And remember how I teased you with a picture of a sandwich dripping with it? I’m no meany. I meant to share it, and here it is in all its glory: Grilled Chicken Melt with Pesto and Sun Dried Tomato Spread. This is a sandwich that smells so ever loving good when it’s assembled that it takes all the strength you can muster to remain civilized and get it to the table without attacking it first. Restraint around food is a challenge for me around stuff like this. Grilled Chicken Melts with Pesto and Sun Dried Tomato Spread are even more than just extremely tempting, though. 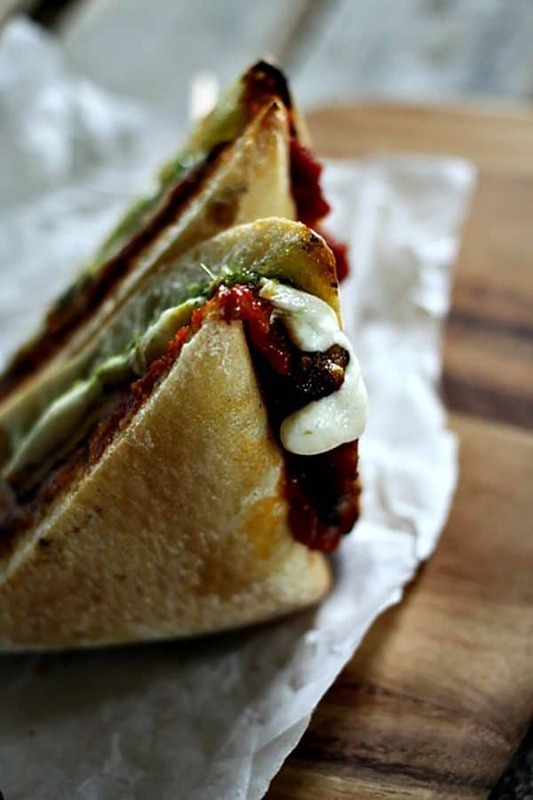 They’re healthy, fast, and simple to make, taking advantage of items you may already have on hand in the refrigerator; fresh mozzarella, pesto, and sun dried tomato spread. Every single one of those ingredients is highlighted and linked because I have a recipe for each of them here on Foodie with Family. Yes, that includes the mozzarella. If making mozzarella from scratch is too daunting for you, you can buy fresh mozzarella at just about any better stocked grocery store. It may not be summer, and it may not even be really warm here, but I’ll tell you this… The snow has finally melted and the sun is making a game effort. I’m willing to go ahead with my warm weather food anyway. Summer, here I come: Grilled Chicken Melt with Pesto and Sun Dried Tomato Spread sandwich in hand! Use small, fresh mozzarella balls (bocconcini) or cut slices from a larger ball of fresh mozzarella for ideal results. If you absolutely cannot find fresh mozzarella (usually located in a deli area or at an Italian grocer) you can sub in whole milk mozzarella cheese that you grate by yourself. Please don’t use the pre-grated, bagged stuff. Most often the pre-grated stuff is dusted with a powder to keep it from clumping, but that powder also keeps it from melting into that creamy, gooey, stringy mozzarella we love so dearly. Use homemade OR store bought pesto. The fresher the pesto is, the more flavourful it is. Fresh ciabatta rolls are often available in mid-sized grocery stores in the bakery section. Many stores also carry a frozen version. Whichever you choose don’t skip toasting them, you’ll appreciate the small bit of effort required to toast them when you take that first bite. 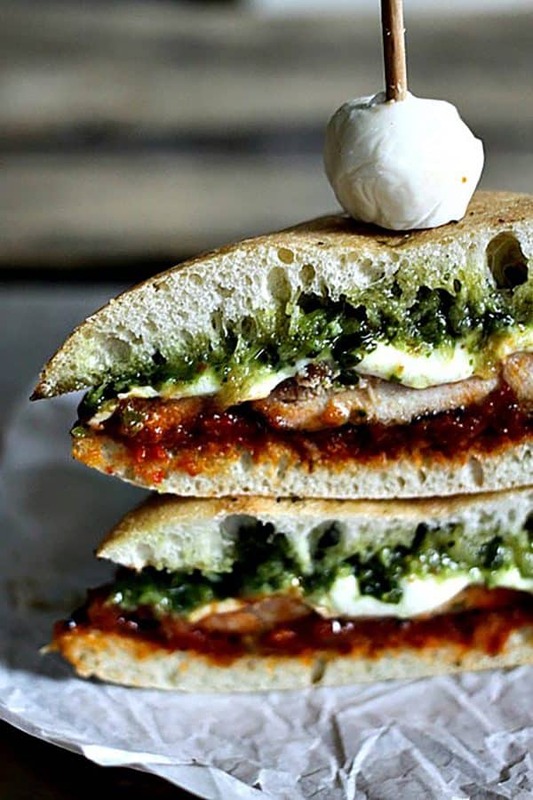 Tender, juicy grilled chicken thighs topped with creamy, gooey, melted fresh mozzarella, fragrant pesto, and flavourful sun dried tomato spread on a toasted ciabatta bun screams warm weather. 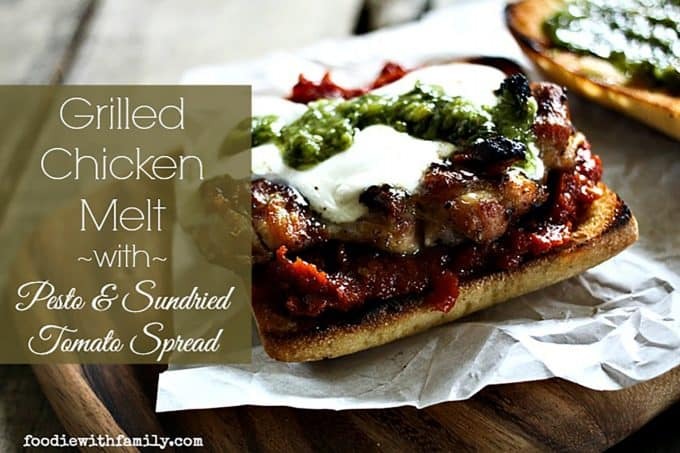 Grilled Chicken Melt with Pesto and Sun Dried Tomato Spread is an ideal recipe for entertaining in warmer months by virtue of both its beauty and ease of preparation. Lay out the chicken thighs and sprinkle both sides generously with salt and pepper. Heat grill to medium. When the grill is up to temperature, lay out the chicken thighs. Grill the thighs, turning a couple of times, for 10-12 minutes, or until the internal temperature of the thickest part reaches 165°F. Just before removing the chicken from the grill, lay out one slice of mozzarella over each chicken thigh. While that begins to melt, drizzle olive oil over the cut sides of the ciabatta rolls and lay them directly on the grill. When the cheese is hot all the way through, use a spatula to transfer the thighs and toasted rolls to a platter. Spread 1 tablespoon of the Sun-Dried Tomato spread on the bottom, half of each roll, then 1 tablespoon of the pesto on the top half of each roll. Use a spatula to transfer one chicken thigh, melted cheese side up onto each roll's bottom half. Position the top half, pesto side down, on the chicken. If desired, slice the sandwich in half on the diagonal. Serve hot, warm, or room temperature. This recipe originally published on May 12, 2014. And now my mouth is watering! At 9:45 at my desk…I cannot wait to try this. All of my favorites in one sandwich. Is it time for dinner yet? Gorgeous! If this was Mexican food I’d call it Christmas style. Since it isn’t, I’ll just call it Good! YOU are very welcome! And you kind of made my day! I cannot get the recipe for the Sundried Tomato Spread to open? 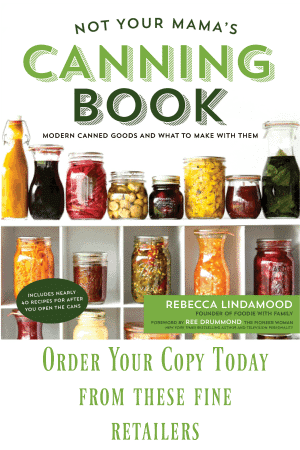 Can you also provide a link for your homemade pesto? I can’t get it to open from here. This sandwich looks amazing! 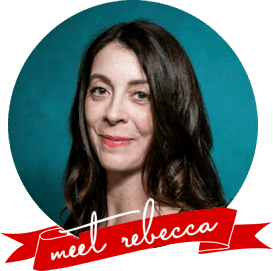 OMG – I can’t believe that can possibly be only 444 calories! I came across this while looking for recipes under 500 cal, and thought it looked so ridiculously decadent! I am glad I took the time to make both the pesto and the spread – such a perfect flavour match. This was a hit with the whole family, and will be put on the roster on a regular basis. Thanks from Down Under!